In the thick of summer, you don’t have to turn the oven on to prepare a delicious meal. This spiced cantaloupe gazpacho doesn’t need any heat at all, but it’s so filling and tastes so rich. 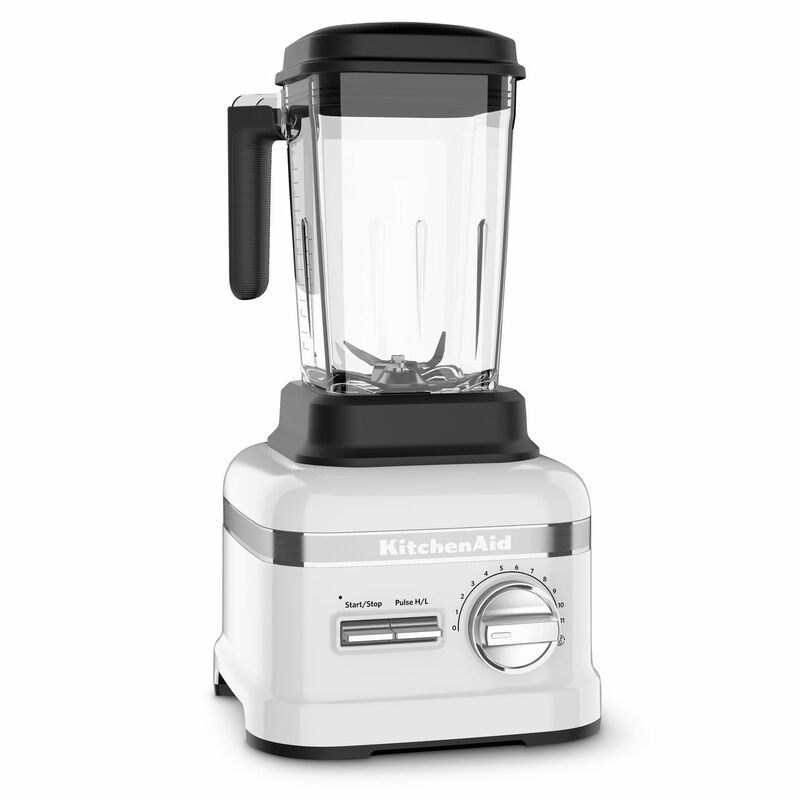 The KitchenAid® Pro Line® Series Blender is so powerful that it blends up a gazpacho to a smooth, creamy texture without any pulp in just a few seconds flat. I like to think of gazpacho as the slow cooker of the summer months – just toss all your veggies and melon in the Pro Line® Series Blender in the morning and by the time you get off work, you have chilled soup ready to go for dinner! When we got to the point at which our AC-free house reaches temperatures over 80° F inside, we often turn to smoothies. Don’t get me wrong, smoothies are great and all, but you can only drink so many smoothies in a row before you start craving something savory (no matter how many greens you throw in to make it feel healthy). That’s where gazpacho shines. It’s smooth and blended like a smoothie, but savory and complex with plenty of seasoning. 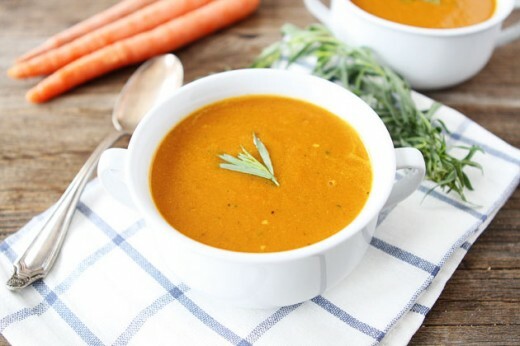 Chilled gazpacho soup is also best eaten with a spoon and, with the help of garnishes to add texture, it seems to fill you up quicker than a smoothie. The garnishes actually serve a purpose more than just making it look fancy and appealing – they give you something to chew on, which helps you produce saliva that contains enzymes. The enzymes help kick start the digestion process. This is another benefit to eating your chilled blended soup with a spoon! For garnish, I use melon balls and chopped cucumbers and shallots, but I also throw some toasted pumpkin seeds and feta on my leftovers for lunch the next day. Both ways are equally tasty. Feel free to add things you have on hand. Halved cherry tomatoes or other nuts make great toppings. When I said this recipe couldn’t be easier, I wasn’t lying. The first thing you need to do is prepare your veggies and fruit. Peel and slice the cantaloupe, cucumbers, shallots, and ginger. You actually can throw most of these in the blender in big pieces – I only slice or chop things to make it easier to fit it all in. Peeling the cucumbers keep the soup color from getting muddied, but if you don’t mind that, then skip the peeling. Once all your veggies are prepped, throw everything into the Pro Line® Series Blender along with the olive oil, vinegar, salt, and pepper. Divide the gazpacho between four bowls and garnish as desired. When you’re done eating, the Pro Line® Series Blender has a Self-Cleaning Cycle that cleans itself. There you have it! Easy summer meals don’t get much simpler than this. 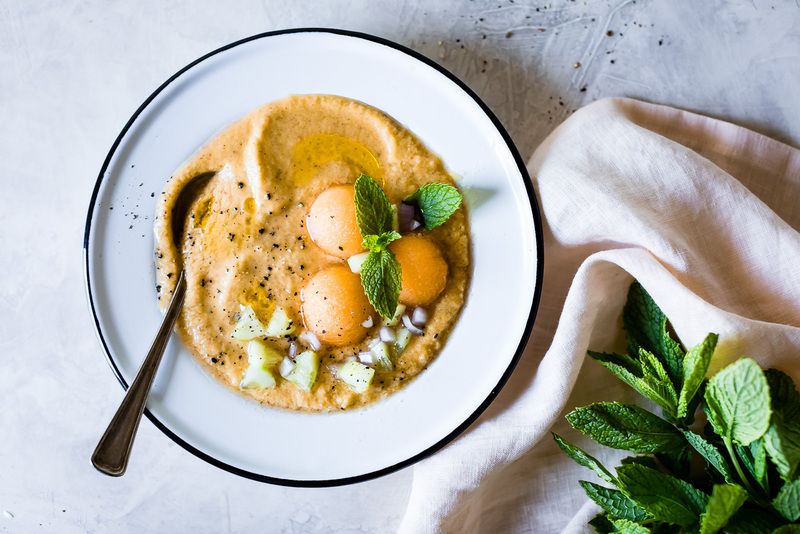 Share your take on this Spiced Cantaloupe Gazpacho on Instagram using #ForTheMaking for a chance to be featured. 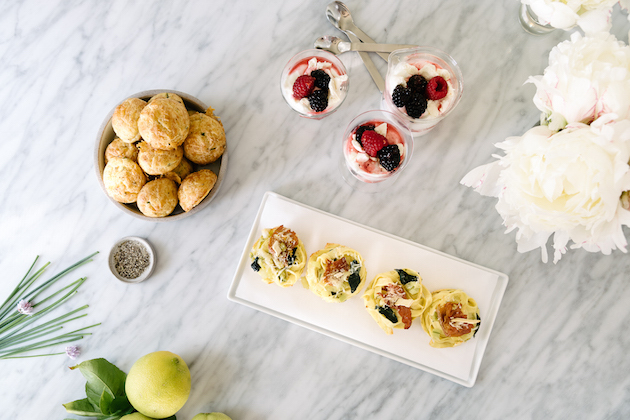 Use a melon baller or a small cookie scoop to make a few melon balls for garnish and set aside, if you desire. Peel and slice the remaining cantaloupe. Chop half of the cucumber into wedges for garnish and set aside. 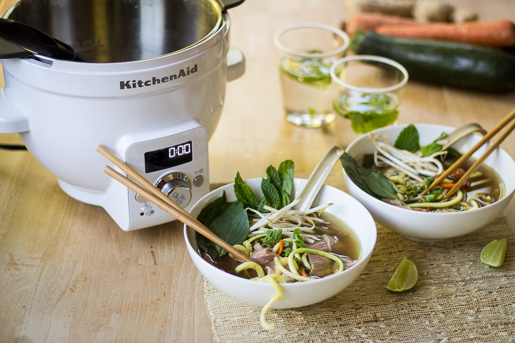 Add the cantaloupe, cucumbers, tomatoes, shallots, radishes, ginger, mint, olive oil, apple cider vinegar, and lime to the jar of the KitchenAid® Pro Line® Series Blender. Starting at low speed, begin to blend, increasing the speed to full power, until the gazpacho is smooth. Season with salt and pepper and pulse to combine. Taste and adjust seasoning, adding more vinegar, salt or pepper, if desired. Chill thoroughly or until ready to serve. Give the gazpacho a quick stir and divide it between four bowls. Garnish with melon balls, chopped cucumber, shallots, and a few fresh mint leaves.